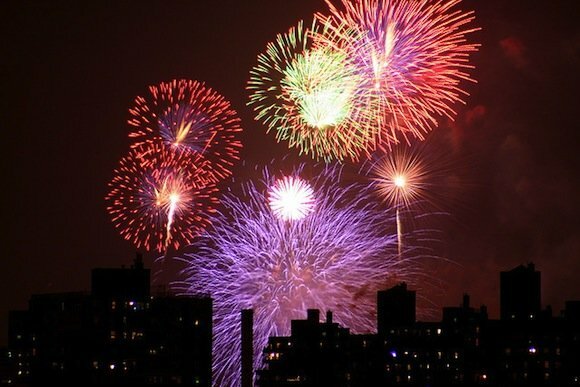 It wouldn’t be the Fourth of July in NYC without the annual Macy’s fireworks show, which made its debut in 1976 to commemorate the nation’s bicentennial. The iconic display will return to the East River this year; fireworks will be set off from the Brooklyn Bridge and from barges in the water below. The best viewing spots will be from Brooklyn Bridge Park and the Brooklyn Heights Promenade, and along the east side of Lower Manhattan. If you plan on heading to where the action is, arrive by 5 PM to snag a good spot (the light show starts at 9 PM). Fifty thousands of pounds of fireworks will go off in time to music. The highlight of the spectacular 25-minute show is a flag made out of fireworks that will burst in the sky while the national anthem is performed. The musical score accompanying the display also includes the Military Salute and Yankee Doodle Dandy. Celebrities bringing some extra sparkle to the show include Enrique Iglesias, Ariana Grande, Miranda Lambert and Lionel Richie. The live stream is being hosted by America’s Got Talent‘s Nick Cannon and gets underway at 5 PM ET/PT. That gives plenty of time for those not able to make it in person to get warmed up ahead of the fireworks display kicking off at will be set off from the Brooklyn Bridge and barges on the East River. Beginning at 8 PM ET/PT or 7 PM CT/MT, the fireworks display will start in earnest at 9 PM. For those who are lucky enough to go see it in NYC, there will be elevated viewing platforms on portions of FDR Drive. “We are thrilled to be working with our partners in the City of New York to have the magnificent Brooklyn Bridge as our canvas and stunning backdrop for this year’s bigger-than-life display,” said Amy Kule, Executive Producer of Macy’s 4th of July Fireworks, according to CBS New York. For the full list of access points, click here.